One of main criteria for the selection of elements of cable routes is type of material coating. The selection of suitable material should be made on the basis of information about the environmental conditions in which the routes will be assembled. The key parameter influencing the loss of the protective layer is corrosivity class of the environment. 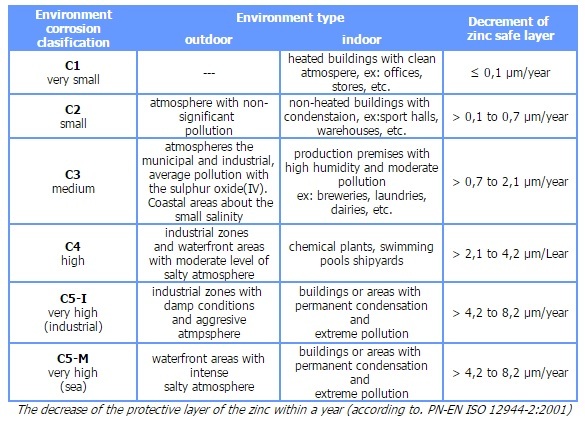 EN ISO 12944-2 standard gives the classification of environments by annual loss of the protective layer (see table). Multiplying the annual reduction of the protective layer by the expected lifetime of the coating we receive minimum thickness of the protective layer. We offer three types of protective zinc coatings that differs by application method, and thus the coating thickness and appearance. The elements are subjected to the electrolytic bath which causes deposition of zinc ions. It causes creating glossy coating of about 5 µm thickness. The method is mainly used for small parts, also threaded ones (bolts, nuts, washers, anchors). For applications in environments with very low and low category of corrosivity (C1 and C2 according to EN ISO 12944-2) we recommend products made of steel galvanized by Sendzimir method. Those products are made of steel sheets, that are pre-galvanized in rolling process. This process creates steady, uniform coating of average thickness of 19 µm. Further processing - cutting, punching, bending does not lead to progressive corrosion. Example of use: offices, banks, libraries, commercial buildings, other public buildings. Elements made of black sheet are covered with a protective coating by dipping in molten zinc at about 450 ° C. Hot dip galvanized components are used in an environment of high corrosivity categories - C3 and C4 (outside as well). The minimum coating thickness obtained in a galvanizing process, depending of the sheet thicknesses are shown in Table 2. The hot-dip galvanizing process allows to control thickness of the resulting protective layer. On individual order it is possible to make products with increased thickness of the zinc coating, and what follows - a prolonged lifetime. Application examples: Refineries, mines, chemical plants, power plants. Used only in highly aggressive environments. Despite the high prices those kinds of materials are often preferred alternative due to their long lifetime. Misunderstood saving can lead to frequent repairs, or interruption of operation of the equipment, and thus financial losses. The powder coating process consists of two stages: applying paint directly to steel surface by spraying it and then heating in an oven at a temperature of 160-200 deg. Celsius for approximately 20 minutes. This process creates a smooth coating. That type of coating has very high corrosion resistance. Powder coated products are used especially in places with high corrosive environment as well as wherever aesthetics is required. Keep products in dry and drafty room. During storage, the products has to be protected against rapid temperature and humidity changes. For long-term storage products should be covered with thick layer of protection oil. When products are stored with exposure to weather conditions, use the cover that provides breathability and moisture outflow. Soaked products has to be immediately dried, separated from each other and stored in a dry and ventilated area until dry. The occurrence of moisture signs or mechanical damage WILL RESULT IN REJECTION OF ANY COMPLAINTS. All metal tray systems must have the same electrical potential. In order to ensure safety, it is recommended to connect each part of the system using a suitable electrical conductor. For products that are painted or covered with a layer of epoxy it is necessary to remove the coating around the place where the conductor is connected.